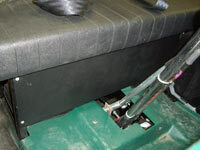 Easy to install winch plates, lets you use reasonable priced winches. 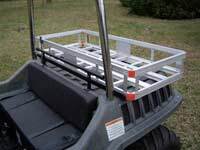 Fits all MAX II machines, quick flip up design, therefore allowing access to factory underside storage area, also allows quick access to your engine cover for general service. Rack, hinge and mount kit weighs only about 20 lbs. Complete kit with all mounting hardware, includes tail reflectors. 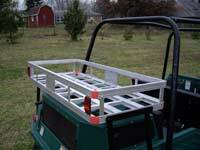 Solid design to hold lots of cargo in its' 48" x 22" size. Designed to be an easy installation. Increases the MAX's usefullness. 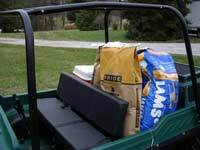 This kit fits all MAX IV machines and turns the unoccupied back seat into a neat large cargo area. It folds down with no tools and back up to become a seat again! Fits all MAX IV machines. Useful to prevent small items in rear floorboard from sliding into front floorboard. Used to keep items in the rear floor in the rear floor area.